Summer and vacation go together like peanut butter and jelly. Whether you’re hopping a plane for destinations far away, hitting the road for family fun, or just sticking close to home for a stay-cation – no other time of year is better. One thing all vacations have in common is that they all need some sort of planning before they happen. Even a simple car trip to visit family needs a few things to be considered. 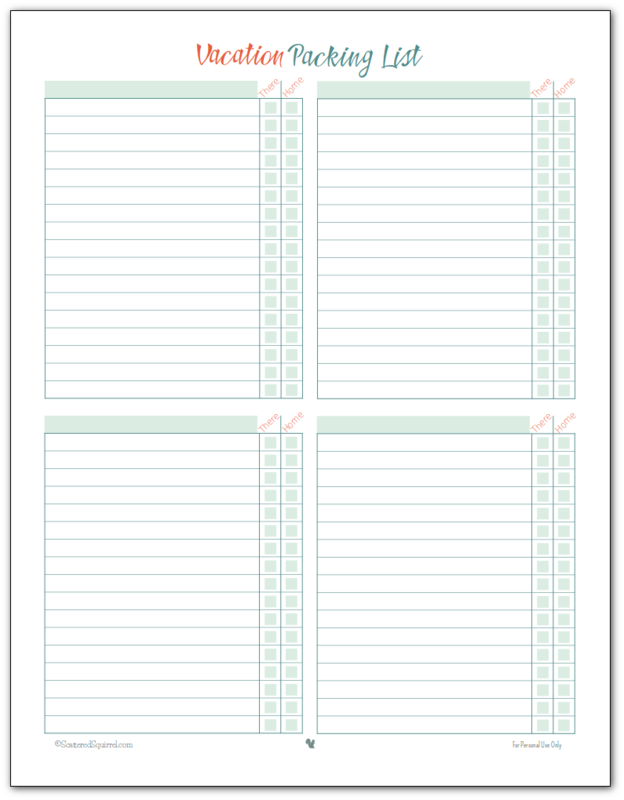 Since printables are always my go-to tool for all my planning needs, I whipped up some vacation planner printables. I can’t wait to share them with you, so let’s jump right in and take a closer look shall we? Vacations are supposed to be fun and relaxing, and I firmly believe that planning them should not be stressful. Depending on where you’re going and what you plan to do – the planning process might be more involved. 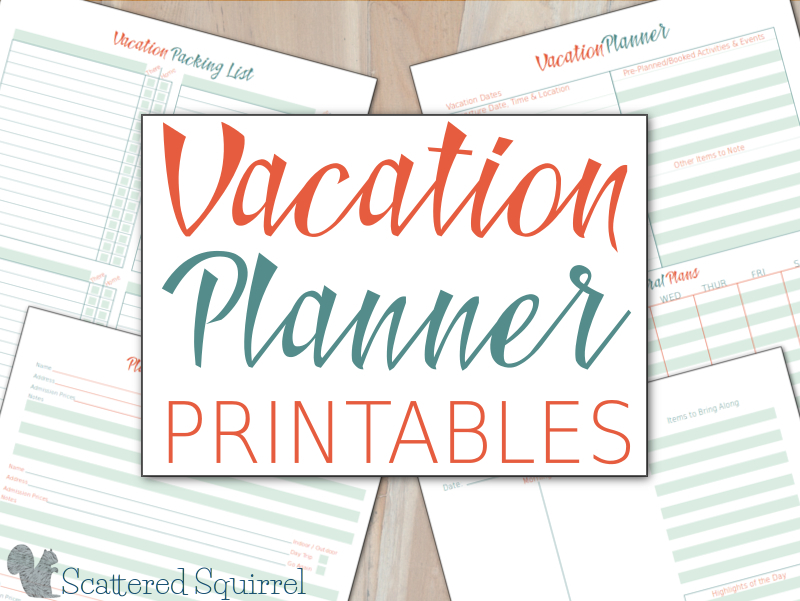 For the most part, I think these vacation planner printables will come in handy, no matter what kind of vacation you are planning. Did you pre-book a tour or pre-pay for an activity? 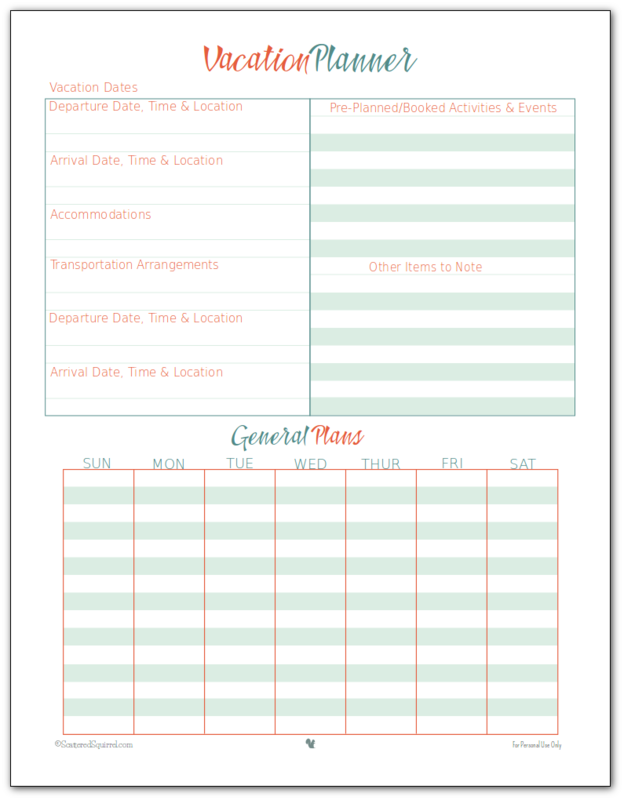 There is a lot to consider and keep track of when planning a vacation, and this printable is the place to keep all those details together. There’s room to keep track of when you’re leaving and arriving, where you’re staying, transportation if you need it, plus space to keep track of what you’ve already booked and what else you want to do. Use the calendar at the bottom there to jot down your general plans so you can see at a glance what’s happening. I left it open so you can section it off into multiple weeks if you choose. Whenever we travel I’m mindful of the amount of space luggage takes up, so I like to plan out what I’m packing. Sometimes I plan by person and sometimes I plan by the bag so I can keep things better organized, but I always – ALWAYS – make a list. I use the light green boxes on top of the lists to designate who or which bag the list is for. Then I write down what we need to bring and check it off as I pack it. I can’t count the number of times we’ve gone to visit my parents and forgotten something there, so I started bringing our packing list with me so I could make sure that what we bring with us comes home with us. Part of the fun of going on vacation is being able to experience new things and visit new places. Even if your vacation is a staycation I’m sure there are plenty of attractions and activities near you that would be new and fun for you and your family. 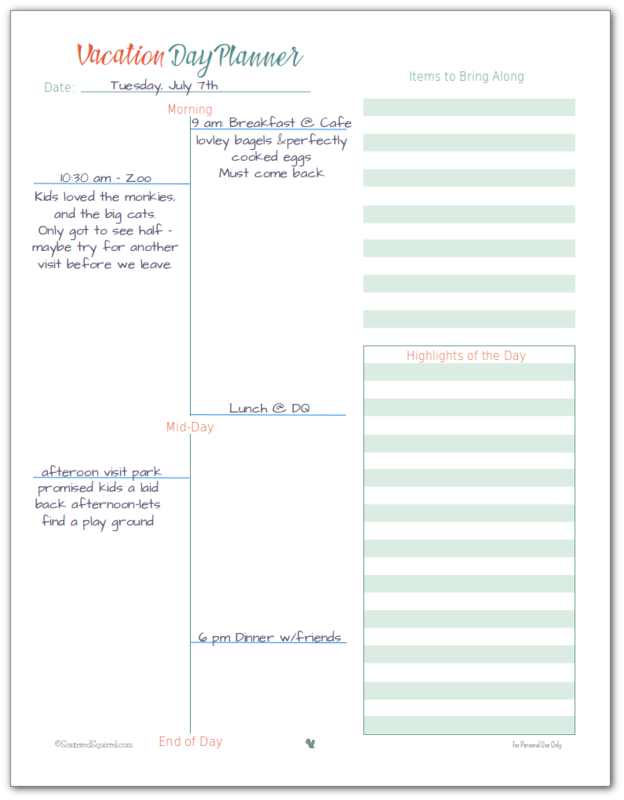 This vacation planner printable is a spin off my family fun activities planner. Each section gives you room to jot down the name of a place you want to go or thing you want to see, the address and the admission prices if applicable. On the right-hand side, you can circle indoor or outdoor (this is super helpful for those rainy days) as well as check off if it needs to be a day trip and if you want to go again. I included a notes section in case there is anything you want to remember about them for next time. I don’t like to follow a strict schedule when I’m on vacation, but sometimes you need something to help make sure you’re not overloading your day with too much stuff. Rather than create a typical planner, I thought it would be fun to combine the idea of a day planner with a journal. 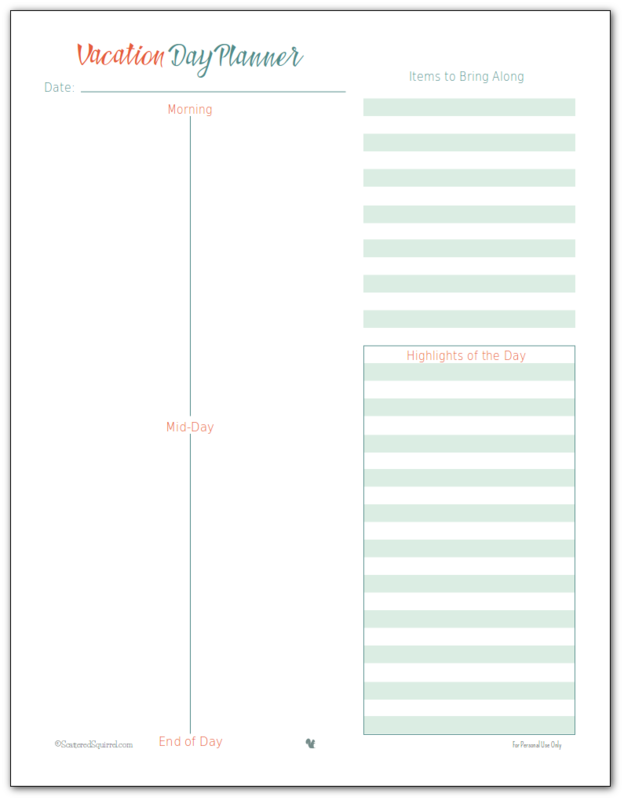 With this day planner, I wanted something that would let a person sort of loosely schedule (for lack of a better word) their day without being too confining or rigid. I wanted to make sure there was a place to note down anything that was needed for the day, just in case you’re off on an adventure and need to remember to bring a lunch or something. Then I thought about how our family likes to recaps our days in the evening, and I thought it would be really fun to include a space to jot down the highlights of our vacation days. Things we loved and don’t want to forget. Now, let’s get back to that day planner side. I realize it looks kind of weird, but here’s a picture of how I use it. I think the visual will be better than me attempting to explain it. The way I pictured this planner in my head was as more of a timeline than a planner. As you might have noticed, I also included little notes, because I think the planner side could also be a fun place to keep notes of your thoughts, and as a total bonus, it will be something nice to look back on when you get home. 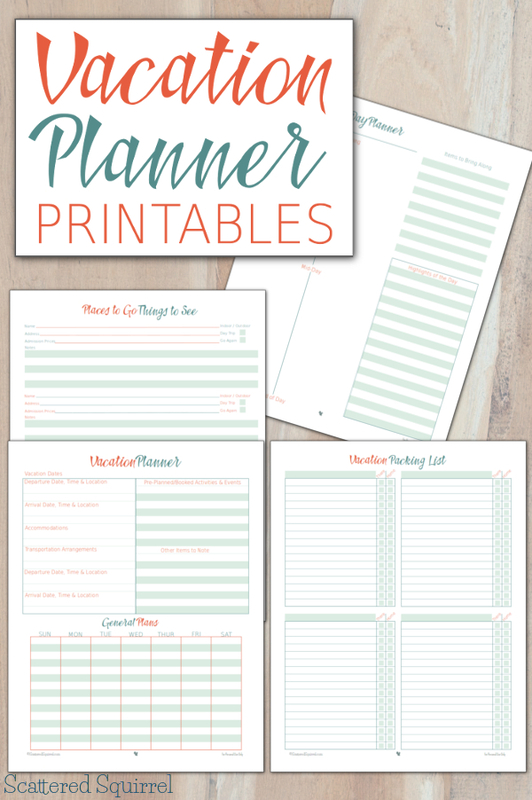 Whether you choose to use them all, or only need one or two, I hope these vacation planner printables help meet your vacation planning needs all year round, not just in the summer. Are you heading out on vacation this summer? Camping? Staying home? I’d love to hear about your plans. Previous Post: « Want to Learn How to Take Better Photos? Me too! Absolutely love that the packing list has checkboxes both for going there AND coming back. I’m pretty good at remembering to take a toothbrush somewhere, but I always have that frantic “I packed everything back up, yes? !” with a tour of the place to make sure nothing of ours is left! Some of your best Printables yet!!!! I just love these!! Thank you so much!!! Thanks so much Kimberly, I hope you find them useful the next time you’re planning your vacation. I really can’t pick which printable I love most on this post! I am an organizer, even though I try to let go a bit while we are on vacation. The things to see would get used the most on our vacations. We all do a lot of research before we visit somewhere new, but always seem to forget what we found! The Things to See one was created because I’m famous for wanting to go somewhere and then forgetting that I wanted to check it out until we get home. Lol Vacation is a great time to let things go, and keep schedules to the basics. I think as Moms, we need that down time. So many choices! I get a bit overwhelmed when it comes to vacation planning. These are super helpful and I thank you for them. I really like the packing list. I am planning to make a general packing list once and for all. One each for 2 different seasons. That way I can just whip it out, make small changes and know exactly what I need to bring. Sharing with others who will love this. I love the idea of having two packing lists made up for the seasons. That would make packing really easy, just check the right list. No need to think about it. Love it!!! Love these – especially the day planner. i like to make a photo book when we come back from vacation and it’s good to have those memories jotted down to go alongside the photographs so you can remember what happened when! I agree. I can’t count the number of times I’ve gotten home and finally get around to organizing the vacation photos only to have no idea of what each photo is really about. Wow! These rock! I am so excited to use these on our next trip, well actually all our trips-even short camping trips. Cool. Thank you so much. You’re very generous. 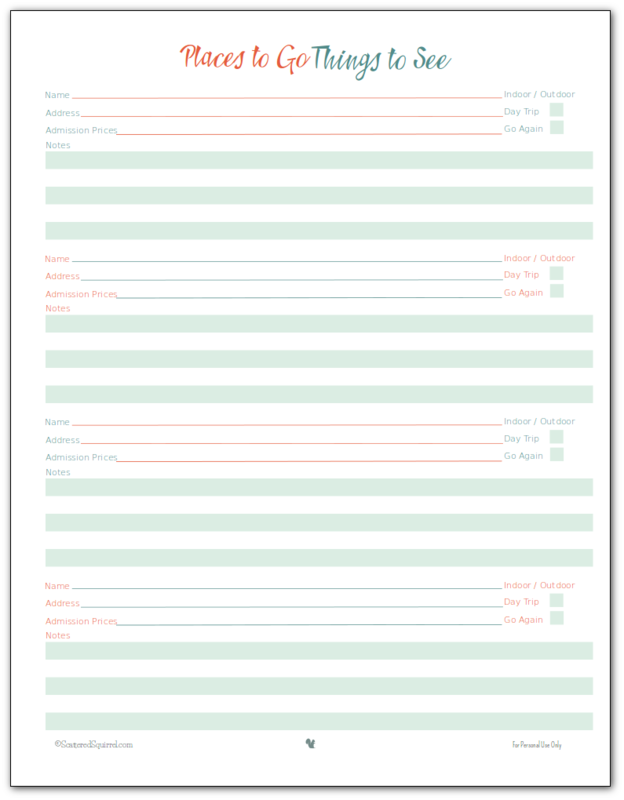 I am trying to print your vacation planner printable and not able to find a way to do so. Can you help? Would you like me to email you a copy of the vacation planner pdfs? Thank you for uploading these! These will come in handy on my May trip from the DC area to Hilton Head Island, SC. I’m traveling alone with two toddlers, one will be 2 months shy of 2 years old and the other just turned 3. My brain gets so scattered at times LOL! I love having the planners though so I can stay organized more. I’ll be looking through the rest of your site as well here in a few minutes, only got this far while google searching vacation planner templates. Hi Ashleigh I’m happy to hear that you like them and that will come in handy for you. Planning a vacation can take a bit of work, I hope they help make it a little easier. Thank you! I’m loving this set! These are absolutely perfect for my upcoming trip to Gatlinburg, Tennessee. So much to do and see and this definitely helps sort it all out. Hi Joanna, I’m so happy to hear that you like them. I hope you have a wonderful trip! So many great ideas…so glad Google led me to you! i cannot find the link to download the printable? Hi Elise, to download the printables just click on the pictures. I use a bullet journal and was looking for ideas on how to create pages that would be helpful to have while on vacation. Your Vacation Planner page is a very good at-a-glance set-up. I also look forward to using the Vacation Day Planner. Don’t know how the vertical timeline will work, but it looks like there’s room for sketches or stickers. Thanks for sharing! I have been wanting to try bullet journalling for a while now, are you enjoying it? There is plenty of room for stickers and sketches, I never thought of using stickers on that sheet before! I hope you find them helpful! This travel planner is amazing! It’s just what I need to plan my trip to South Africa. One question, how do I print them?!? Hi Heather, sorry for the late reply. Just click the pictures of the ones you want and then you can download the PDF versions to your computer so you can print them that way. I print as many of them as I need. Usually one copy of the packing list and the planner. Then I do one or two of the weekly ones, and as many of the daily ones as I need for the trip. I hope that helps. This was so helpful in planning our girls trip. Thanks so much for sharing! I’m happy to hear that you found these helpful for your trip Linda! I hope you had a wonderful girls trip! You’re very welcome! I hope these come in handy for planning your trip. It sounds very exciting.